After attending WordCamp Europe 2014 in Sofia, Bulgaria it was a given to attend this year too (and next year…and the one after that…and the one after that and so on…). Having it in Seville, Spain this year was a delightful bonus. It took place in the heat of summer 26-28 June 2015. This year, 948 tickets were sold with 43 speakers. The temperature was in the region of 40 degrees C, but I was definitely not complaining. 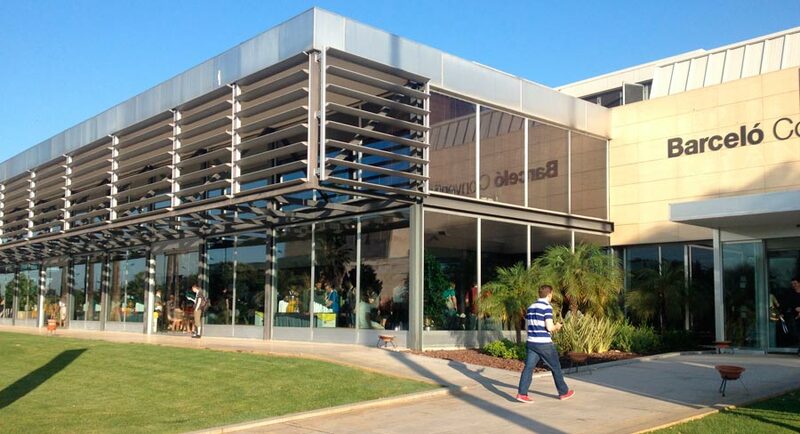 The venue worked well with the weather (bar and pool at the back…). Same as last year, Kristin continued the tradition and made an awesome infographic again. 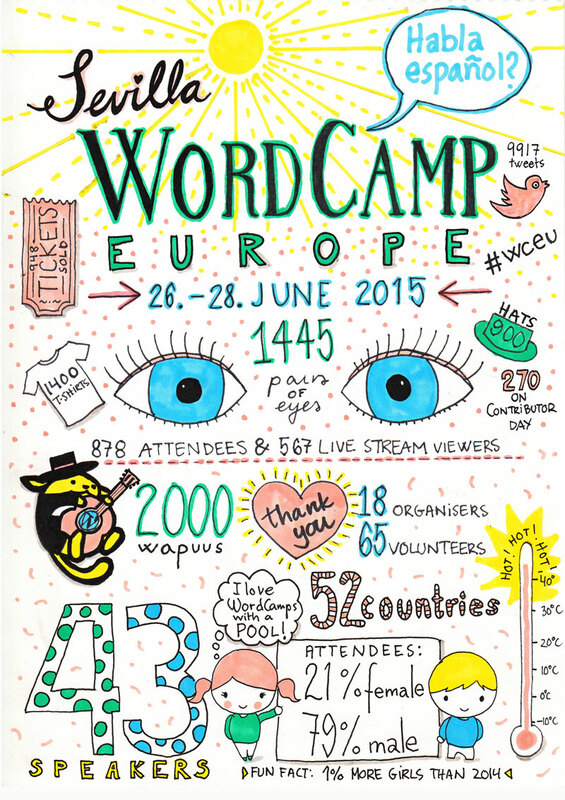 It contains info that I find interesting and serve as great statistics in a creative way, which can form a nice comparison over the years of WordCamp Europe. The first talk I attend of the day was The Accessibility-Ready Tag for Your Theme: Why and How by Rian Rietveld. Luckily the awareness of accessibility online has finally become a hot topic. Rian is an expert on this and I hope to see more talks by her on this topic. The next session was a bunch of short talks. I was specifically interested in WYSIWTF by Adrian Zumbrunnen. 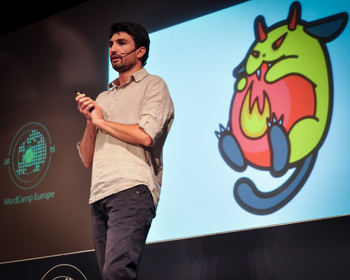 I saw a talk by him at WordCamp Europe 2014. As a front-end developer, I’m a huge fan of his work. At this year’s conference it was almost a sequel from last year’s, but ‘you can follow it without having see the first one’. He made an editing tool that can be used in the browser, making live changes to published work. He then announced that the Beta version is available for people to try out. You should check it out! After the morning coffee break was The PHP 7 Story by Zeev Suraski an Israeli programmer, PHP developer (created PHP 3 and wrote the core of PHP 4) and co-founder of Zend Technologies. He went through the whole PHP timeline and it also answered my question why there is no vesion 6. I really enjoyed Nikolay Bachiysk’s talk on A Few WordPress Security Principles. To me, not the most exciting topic, but by using Wapuu characters in a cute story, made context more fun, creative and digestible. On this first day, after lunch, followed with the famous Q&A with Matt Mullenweg, which has become a WordCamp Europe and WordCamp San Fransisco (WordCamp America now) tradition. Watch the video here. I personally thought, some of the answers to the question took a bit too long, which makes it easy to get distracted. The second day started off with a bang, the first two talks were of great interest to me and was relating to each. In general it is a hot topic in the WordPress world. First up was The WordPress REST API by Ryan McCue (photo below), a young genius that was 14 when he started contributing to WordPress. At the time of the presentation he was 21 and is a WordPress core contributor. He is the lead developer of the JSON REST API project that will bring the full REST API natively into WordPress. His talk went over all the basics of how to start using it. 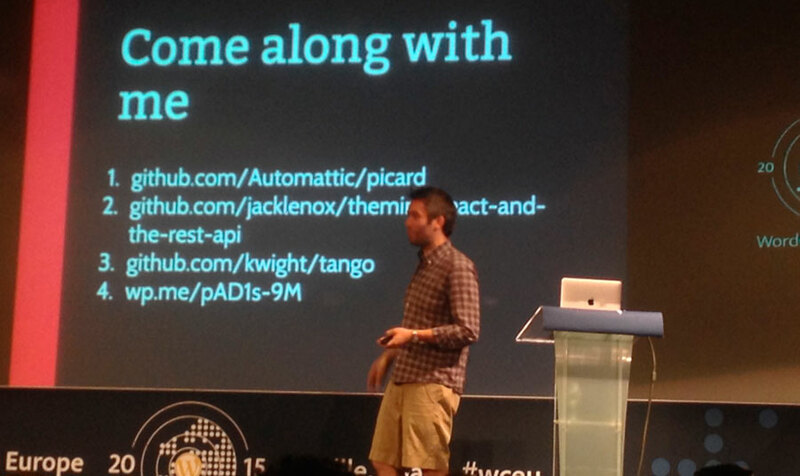 Theming, React and the REST API by Jack Lenox’s (photo below) talk ran over his process using the REST API to build a theme. He has even made some code available on GitHub to get me started. Which can be found here. I enjoyed the Short talks of day two too. First up was Franz Vitulli, that touched on the benefits and challenges of a great user support and training. 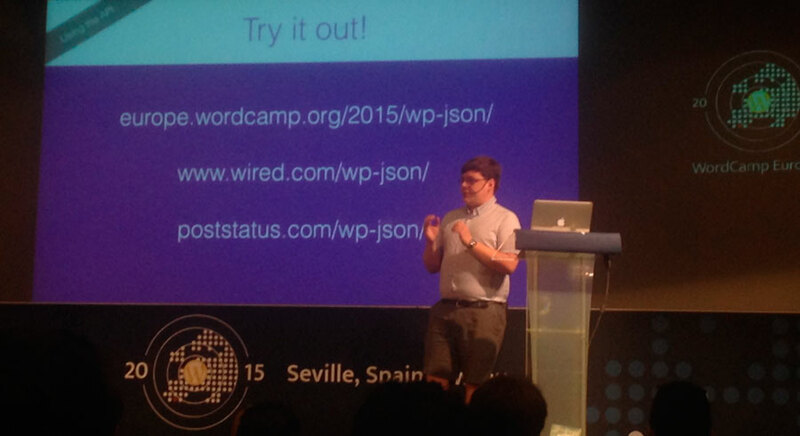 Then it was Joan Boluda on Internationalization: Plugin documentation and support for the whole world. Ilona Filipi ended the short talks with their Winning Formula For Working With and Retaining Large Clients. I’ve seen her talk twice before and has become a must for me. Talking about their road to success is always very insightful. I also try not to miss a talk by Tammie Lister. I find her to be one of the go-to person when it comes to building themes. Her talk on Mighty Morphing Design was about how it works on any device, in any place and how these are designs that optimise, reduce and change depending on the device you are using. Watch the video here. Another one of the my favourite talks were From Commercial Themes to the Fastest Growing E-commerce Platform Online by Mark Forrester. A story reflecting on their journey, including growing pains and lessons that was learned, from building premium themes to a team of 50 supporting the biggest e-commerce plugin for WordPress. Make sure to watch the video here. In the closing talk it was also announced that WordCamp Europe 2016 will be happening in Vienna, Austria, on 24th – 26th June 2016. See you next year!